1. How to Add a New Form? After logging into the application (1) Select the FORMS tab. (2) Press Add a New Form Button and (3) Name your Form and press OK.
2. How to Edit or Make changes to an Existing Form? 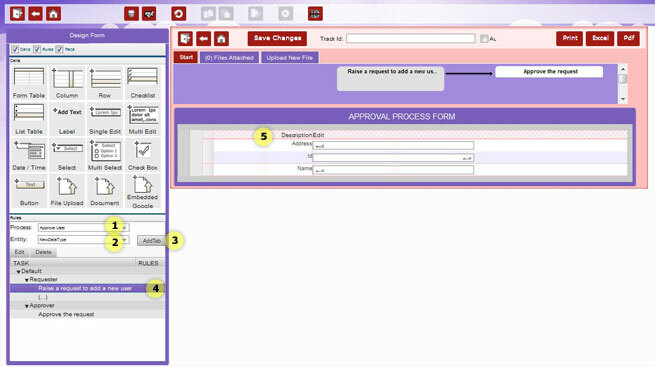 To Edit or make changes to an Existing Form (1) Select the form by clicking on it and (2) Press Edit selected item button. 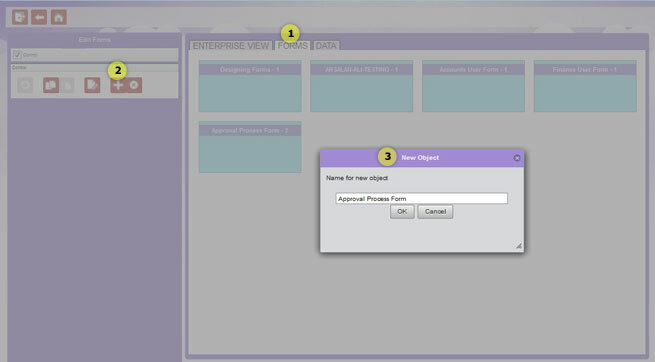 Design Form screen will show up on the screen (1) With an Empty Form (If editing a newly added form). 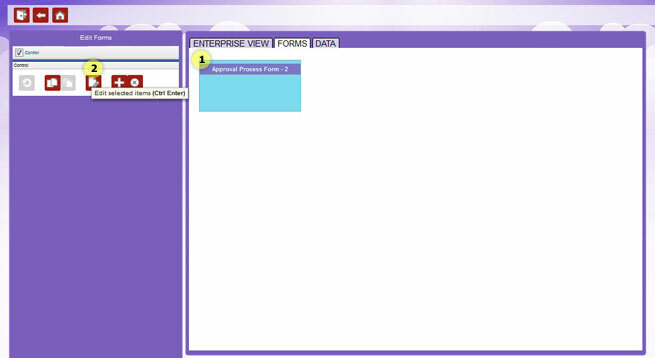 In case of an existing form, last saved form will open up on screen. 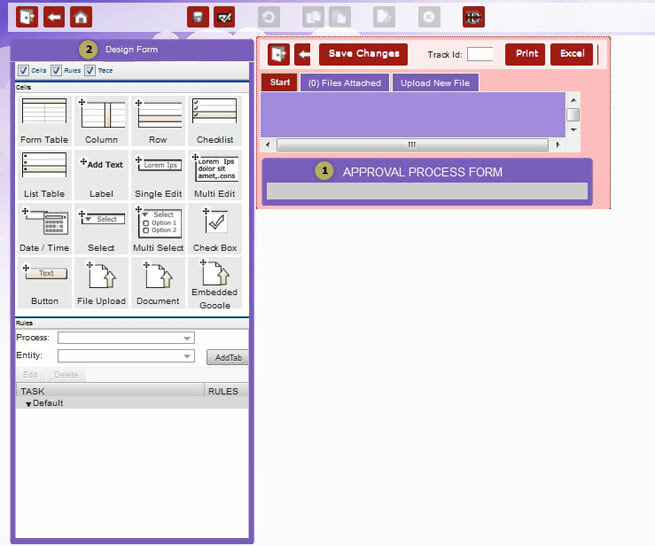 (2) Designing Tools on the left of screen, lets you drag/ drop items on the form to edit/ design the form, as required. 3. How to Start Designing an empty/ New Form? To start designing an empty form (1) Select the appropriate process from the Process drop down list, that you want to link this form to, then (2) Select the entity from the Entity drop down list and (3) Press “Add Tab” button. Pressing “Add Tab” will (5) add default columns, rows and fields on the form, with titles. (4) Selecting Task from the Rules section will add the task on which this form will appear along with the flow, on the top of the form. 4. How to add a Column and Row on a form? Add Column onto the form by (1) dragging the Column item from Cells section, onto the edge of the column bar. Similarly a Row can be added on the form by (2) dragging the Row item from the Cells section, onto the edge of the Row bar. 5. How to Add Labels, Fields and other elements on the form? Add elements on the form by selecting the appropriate cell from the Design Form section and Dragging it on the form (1) Label cell to add Label to the field (2) Single Edit to add a single row edit field on the form (3) Multi Edit to add Multiple row edit field on the form. All the cells available in the Design Form section can be dragged onto the form, as required (Details on all the fields can be found in Field Format and Additional Properties).